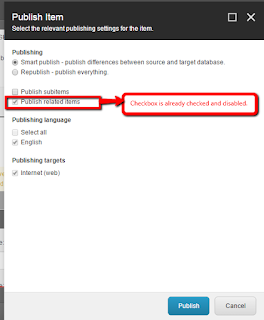 Recently I’d stumbled upon a post on Sitecore Community regarding how to make Publish Related Items checkbox always checked based on a specific User Role. Original question: I need to make 'Publish Related Items' checked every time any content editor publishes an item. It will be nice if I can do it via Roles. 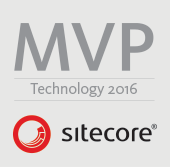 But, if I can’t then I would like to default it for every user in Sitecore. Compile the solution and put dll in bin folder of website root. Open Publish.xml which we have just duplicated and update Publish Form code-beside class to use our custom code-beside class instead of Sitecore's default class. The format is “<namespace>.<class name>, <assembly name>”. For example: SitecoreCustom is namespace, CustomPublishForm is class name and SitecoreCustom is assembly name. Select an item and try to publish it. 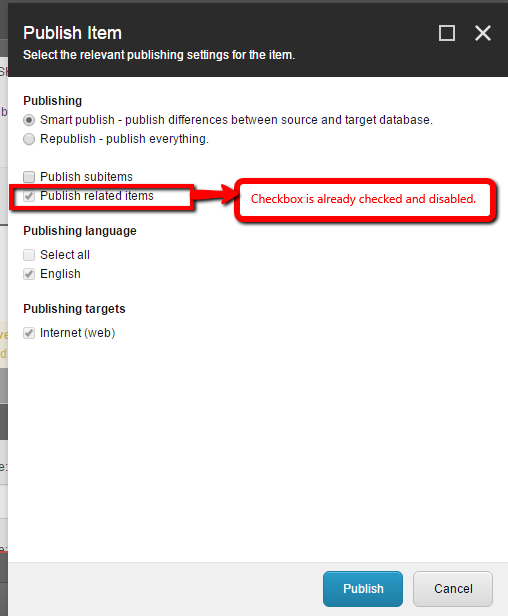 You will see that Publish Related Items checkbox is already checked and disabled.